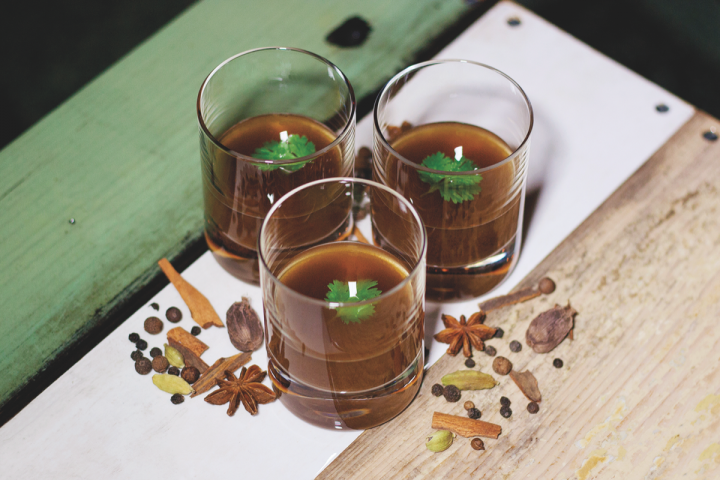 Bone broth adds savory tastes and warmth to cocktails. Bone broth can add unique flavor and texture to cocktails. The Pho-King Champ from Midnight Rambler mixes Absolut Elyx vodka with 15-year-old Oloroso Sherry and Swanson's beef stock. Though bone broth most commonly evokes thoughts of soups, gravies, and sauces, the protein-rich liquid is popping up on cocktail menus, adding a unique flavor, richness, and texture to a variety of mixed drinks. Bartenders are mixing broths with whiskies and gin, touting its versatility, health benefits, and uniqueness. And while they note that some consumers are hesitant to embrace the trend, they add that a well-made bone broth cocktail can be a great menu addition, especially in the colder months. Johnny Swet, co-owner and mixologist at Jimmy at The James in New York City’s SoHo neighborhood, preps a chicken bone broth in the kitchen of The James Hotel. He says inspiration for the drink came from a bowl of chicken soup and that the broth gives his cocktail a soup-like feel. Swet makes the Chicken Bone Broth Toddy ($18), mixing broth with Nolet’s gin, Fee Brothers Celery bitters, and lemon juice, and garnishing the drink with a parsley sprig and sticks of carrot and celery. He offers the toddy during the winter months. In Los Angeles, bartender Dan Rook notes that his bone broth cocktail often starts conversations at the bar. As the lead bartender at Ever Bar in the Kimpton Everly Hotel Los Angeles, Rook makes a riff on the classic Millionaire cocktail using a duck confit bone broth made in the hotel’s kitchen. The Bone, Thighs and Harmony ($16) mixes St. George shochu with Grand Marnier liqueur, house-made pomegranate grenadine, and duck confit bone broth, garnished with sage. Chad Solomon, the co-creator of Dallas cocktail haven Midnight Rambler, uses a pre-packaged beef stock for his broth drink. He prefers the boxed stock because of its shelf stability and says it mixes better in chilled cocktails. His venue offers a broth-based shot called the Pho-King Champ ($8), which mixes Absolut Elyx vodka; Williams & Humbert Dry Sack 15-year-old Oloroso Sherry; sriracha, fish, and hoisin sauces; liquid aminos; lime juice; and Swanson’s beef stock that’s been aromatized with cardamom, black pepper, cassia bark, and star anise. Midnight Rambler previously served a Hot & Sour Chicken Toddy that was made with Beefeater gin, rice wine vinegar, sriracha sauce, and Swanson’s chicken stock ($12).